We threw a birthday party for my older daughter this past weekend – she just turned 5. Since she’s on a science kick, we decided to make a theme of it. We hired Mad Science to come and entertain the kids, we came up with a melee of easy scientific activities to do with the crowd, and I decided to make an erupting volcano cake. I’d read about the idea on the internet, and thought it sounded very cool. I researched a lot, watched some videos on YouTube and even corresponded with two of the people who’d made the videos. I made a test cake on my daughter’s actual birthday to double check the lava concoction, and the party cake came off without a hitch. It was a big hit, and several people have asked me to share my recipe and method. Here’s a photo of the finished product, and I will post the recipe below. If you attempt it, I’d love to see pictures. Thanks go out to my daughter for inspiring the project, my always-patient husband and co-conspirator, my sisters, who both share my fascination with dry ice, my mother-in-law for the new Kitchen Aid — just in the nick of time, my mother for the baking gene and the moral support, and last, but not least, the YouTube ladies who came to my aid. Preheat oven to 350. Spray your pan(s) generously with cooking spray. Put the dry ingredients in a bowl and whisk to combine. Carve out four little indentations (“wells”) in the dry mix. In each well, place a different wet ingredient, then cover the whole thing with the water and mix well to combine. Yes, it’s really that easy. Pour the batter into your prepared pan(s) and bake. Baking time will vary depending on the pan type, but it’s about 30 minutes for a 9″ round. Cake is done when a toothpick comes out clean. Let cool in the pan for about 15 minutes and then unmold onto a cooling rack. When made properly, this cake is very sturdy and easy to manipulate and decorate. If you have a scale, do weigh the flour and sugar. It does make a difference. Beat the cream, sugar and vanilla in the bowl of an electric mixer at high speed until stiff. Gently fold in the cookies. You’re done. Makes 2 1/3 cups, plenty if you’re just using it to level your layers, make lava and do some decorating. Using the paddle attachment on your stand mixer, cream the butter at high speed until light and fluffy. Mix in the sugar alternating with the milk, beating well after each addition. Beat in the vanilla and salt, then add a bit more milk if needed to reach a good consistency for spreading. Reserve half of this frosting to mix with crushed Oreo cookies if you want the “dirt” effect on your volcano. Makes about 3 cups. If you’re making a big cake, double it. Whisk together the sugar, cocoa and salt. Add the milk and vanilla and beat with the paddle attachment of your stand mixer until blended and smooth. Beat in the butter and then add milk to reach your desired consistency. 1. Bake the cakes and let them cool completely. For my cake, I made two 16″ layers, three 9″ layers, a 6″ cake (split into 2 layers), and a bundt cake (split into 2 layers). I had to quintuple the cake recipe to get all the cake I needed. Split cake layers as desired. 2. Make the buttercream and set aside some white buttercream for lava and decorating. Put the remaining buttercream into a pastry bag fitted with a coupler. It’s a good idea (I didn’t do this, but it would have been easier) to mix some cocoa into the buttercream so it will match the color of the chocolate frosting. 3. Make the Cookies & Cream filling. 4. Fill the cake layers – first pipe a ring of buttercream around the perimeter of each layer, then fill the inside of the ring with whipped cream. 5. Use a sharp, serrated knife and a spoon and carefully excavate a hole in the middle of the volcano and insert a long, thin vase or glass (ideally at least 8oz) that will hold the lava mixture. 6. Frost the cake with chocolate frosting. I suggest a layer of plain frosting, and then thin out the remaining frosting and mix in some finely crushed chocolate sandwich cookies. Pour that over the cake for a cool, gravelly effect. 7. Use good quality gel food colors to tint some of the remaining white buttercream red, orange and yellow in three separate glass bowls. Microwave each bowl for just 15 seconds to get it to a thick liquid consistency and pour it over the top of the cake. 8. Decorate the cake. The buttercream recipe here will work OK for piping, though it’s not as stiff as an icing with a higher fat percentage. My husband sculpted Tasha (from the Backyardigans) out of Wilton’s Fondant. 9. To make the lava, mix together about 2 tbsp marshmallow fluff with 2 tsp warm water. Stir until smooth. Tint red with food coloring. When it’s time to serve the cake, toss a handful of dry ice chunks into the embedded glass inside the cake, add the fluff mixture, then pour hot water into the glass. 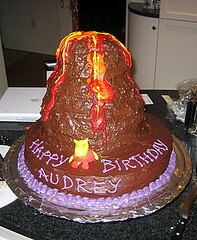 The volcano will erupt with smoke and soon, the lava mixture will bubble to the surface and spill over onto the cake. Do try to keep the cake chilled if you aren’t serving it right away, since there’s whipped cream in there. Good luck! To see more pictures, click here. Wow! I hope I’m cool like that when my kid is older. Im not that artistic but Im hoping I can do this…. What level of difficuty is this cake? It’s a project, and it will take some time. You don’t need to be particularly artistic to pull this off. Make sure you follow the cake recipe closely (do weigh the flour), because the result will be strong enough to bear the weight of all the layers, filling and frosting. Please let me know if you have any questions as you get closer, and I’d love to hear how it goes. where did you buy the dry ice from ? im going to do the recipe u done for my geog project . I bought it locally from Brookline Ice and Coal, but you can probably do a local directory search for “dry ice” or even just “ice” for your own neighborhood. It’s fairly easy to find and not very expensive. Is the “lava” edible after it has been mixed with dry ice? Yes – the dry ice dissolves (or sublimates) and the mixture is safe to eat. I was wondering if you can use regular cake mix? I am using a bunt cake pan that is smaller than a regular one, it has peaks, and it kind of looks like a mountain. I was just going to do one round cake underneath it. Nothing very crazy. It is for a project my daughter is doing on volcanoes in school. I wanted something a little different, but still easy. Could I also use can frosting? I thought this might have a little more wow factor for her than just making a volcano out of play-dough. I just don’t have a lot of time, so I am looking to see if I can cheat a little with box cake mix and store bought frosting. Thanks for your great idea and any input you may have! You can absolutely used boxed cake mix and store-bought frosting. The only real key to success with this cake is the dry ice and food coloring combination in the center of the cake. It’s a great idea to use a bundt cake pan – and actually, I think I know the one you’re talking about – is it meant to look like a flower? You won’t need to carve out the hole in the middle that way. Just find a glass that will fit right into that hole. Have fun! Hi! I’m planning on making a cake like this for my son’s birthday party. On other sites, I have seen the lava made from either an egg white and sugar or jello. Both of these seem a little bit gross to me overflowing on the cake, and seem like it might make the cake soggy. Does your lava version actually flow over the cake pretty nicely? Marshmallow fluff sounds so much more tasty! And does it make the cake soggy at all? Thanks! Yes, the lava flowed nicely, and it just kind of glazed over the frosting, so it definitely didn’t make the cake soggy. I would do a couple of test runs to try and get the proportions right, with the fluff, the water and the dry ice. Good luck with it – it was such a fun cake to make. Good luck with your cake. Let me try to clarify the 3 frostings and the roles they play. 1. The whipped cream (cookies and cream filling) is just a filling to go between the layers. 2. The chocolate frosting goes on the outside of the whole cake, and then you can do a layer of thinned out frosting (use milk, not water) mixed with the crushed cookies for a dirt effect. 3. The buttercream just goes at the top of the volcano for decoration. In the vase for the “eruption” you don’t put any of the frostings – you put the marshmallow fluff mixed with warm water and red food coloring. What a great looking cake! I’m making this and need some help with your Chocolate frosting recipe. Is the 4 Tbsp of butter melted or is it softened butter? Thank you so much! Hi there, I just wanted to let you know that I used your directions to make a volcano cake for my daughter’s birthday and it came out great. Thanks so much for taking the time to write this up. That’s awesome! We’re so glad this is being put to use over 10 years later.